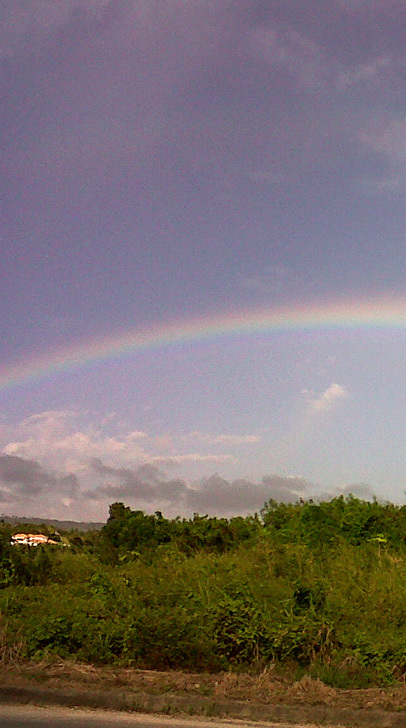 Peculiar Rainbows ~ Mark Worme pictured this strange (see below) rainbow in Barbados. He used a Blackberry phone. ©Mark Worme, shown with permission. 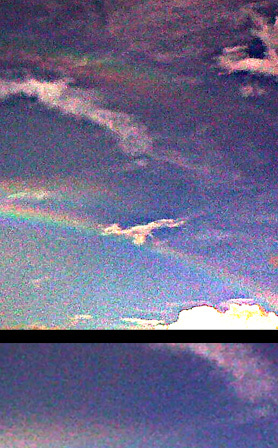 Split or twinned rainbows are rare and transient yet there are several observations of them. This rainbow is different. The ‘split’ at the right hand end curves upwards. The grossly enhanced view of the same image at right hints also that the outer secondary bow is widened or partially split. 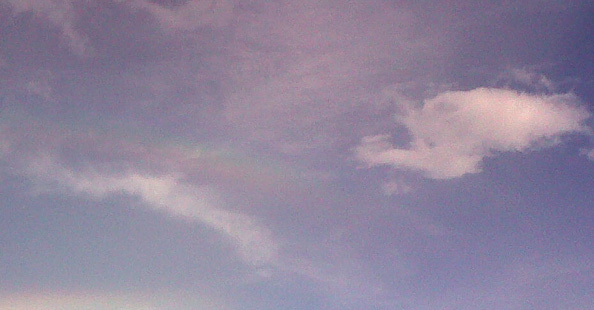 At lower left there is another view of the split primary taken several seconds later. Twinned rainbows characteristically show a second bow, often less distinct, below the primary with an unsplit or disturbed secondary. This bow does not follow that pattern. Is it a reflection bow? A reflection from water or wet surfaces can be ruled out because reflection bows do not intersect the primary in the manner of this one. We could possibly explain the split bow by invoking raindrops elongated vertically like prolate spheroids (as compared to the flattened drops used to explain ordinary twinned rainbows). But extraordinary hypotheses based on a single observation are not very useful. 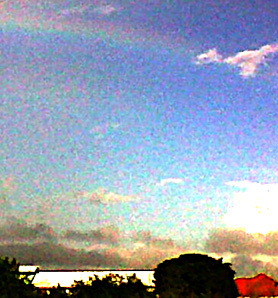 This rainbow, at least for now, likely joins those that remain unexplained.